He’s headed off to the Temple of Doom! A nebbishy rabbi who called himself the “Jewish Indiana Jones” was sentenced yesterday to four-plus years in the slammer for peddling Torahs he falsely claimed to have “rescued” after they were lost during the Holocaust. Menachem Youlus shut his eyes and winced as Manhattan federal Judge Colleen McMahon ripped into him for swindling $1.2 million through the Maryland-based Save a Torah charity he co-founded. Youlus, 51, was ordered to pay back more than $990,000 to his victims. The judge said she couldn’t understand why Youlus — who never even spent the money he scammed — concocted cinema-like exploits of risking life and limb to unearth Torahs buried at concentration camps sites. “The reason, as near as I can tell, is that, Mr. Youlus has a screw loose,’’ she said. 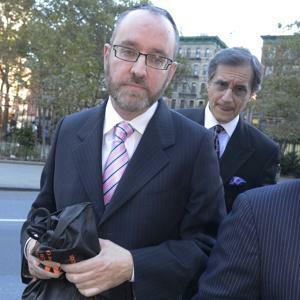 Prosecutors said Youlus passed off everday used Torahs he bought in the United States.